Absolutely beachfront, 1 bedroom condo just 20 meters from the ocean. Corner unit on the second floor of a four-story private beachfront complex giving you a spectacular, unobstructed, wrap around ocean view and memorable sunsets. Sleeps 4 with a queen-size bed in the bedroom and a queen-size sofa bed in the living room. This large, fully furnished, very clean and well-prepared unit has a private balcony, one bath, in-unit washer and dryer, free off-road parking, private gated swimming beach, pool, and Jacuzzi. Trade winds and building design provide all the cooling needed in West Maui. Our unit has windows and doors in front and back, and two large ceiling fans to take full advantage of the cool evening breezes that come down from the West Maui Mountains. Located away from the road giving you the very best opportunity to listen to the ocean and the breezes as they rustle through the palm trees. 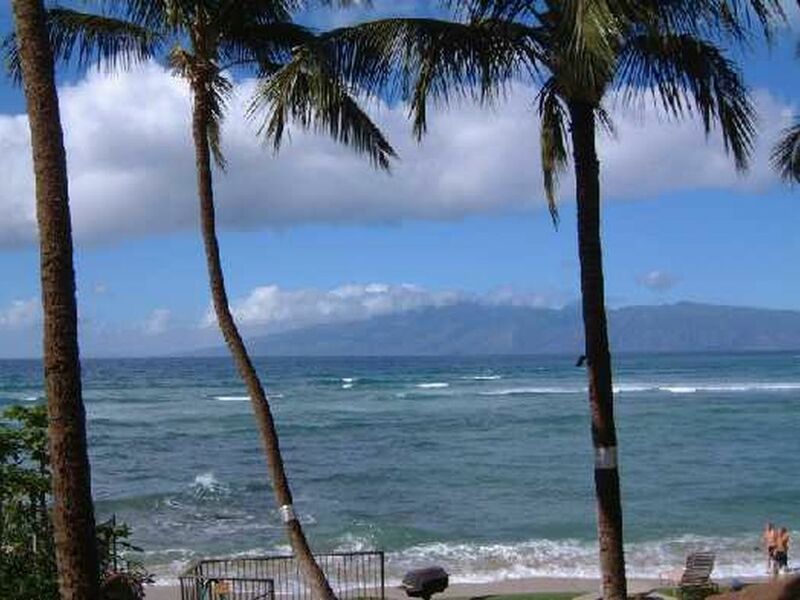 We are owner-operated and this allows us to offer the lowest beachfront-oceanfront rates in West Maui. This unit has high speed wireless internet and is "no smoking" unit. the smoke detector is gone. There is not one in the unit. the bathtub did not appear to be cleaned since the last guest as there was hair and other "stuff" in the tub that we had to clean before we used it. several light fixtures had dead bulbs in them. Overall, a nice place to stay and it was a good week. My new bride had a wonderful time during our honeymoon at this condo in mid to late February. The condo was perfect for what we were looking for - private and quiet away from the hustle and bustle. This was a great deal where got you an amazingly clear view of Moloki and the Lanai Islands across the water with the view of palm trees and crystal blue water in between. We even saw humpback whales breaching from time to time and turtles that swam close to the beach sometimes. Coming from the Southeast part of the United States, I wasn't sure how no air conditioning was going to turn out, but it worked out just fine. Just open of the windows and screen door to let the sea breeze in and fall asleep to the sound of crashing waves. The condo was great because we could buy groceries at the local grocery store a half mile down the road or go out to eat when we were feeling up to it. Using a condo like this is the way to have a fun, relaxing, and adventurous time during your stay on Maui and a way to save money instead of staying at an expensive hotel. My wife and I would love to come back again one day! Thanks Jim and Lorna!!! The property is a lovely little resort with its own private beach, and gorgeous views of the waves and sunsets. It is situated in a great area of Lahaina, (Honokowai) with a lot of high quality restaurants and places to walk, within driving distance, also walking distance to the Farmer’s Market. There is a small pool plus hot tub. Unfortunately there is not a rest room located near the pool area. The pool is refreshing (unheated) but really appreciated it for cooling from sunbathing, as the ocean can be quite challenging for those of us not comfortable in big waves. The hot tub was usually accessible and not filled with too many toddlers using it as a heated pool. Unit B206 is very private and one of the quietest locations in the complex, away a little further from Lower Honoapiilani Rd. There are hibachis for barbecuing which cause some unpleasant barbecue lighter fumes to waft to the suite. Two of the three hibachis are relatively close. A perfect time, however, to go down to the grass and view one of the spectacular sunsets visible nearly every night on this property. The sliding door to the suite sticks. The tub/shower is in need of an update. However none of the cons detracted significantly from a wonderful vacation experience, and good value for the money. Fantastic place to stay! Clean well kept building with concrete walls so super quiet. Friendly people during our stay and very accommodating owners. Would definitely recommend it!